How sustainable is our design process? 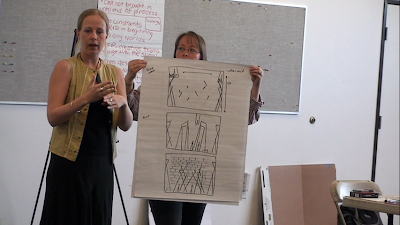 This was one of the questions we set out to explore in Childsplay's second Sustainable Stage Craft Summit. We focused our second meeting on the how and why of the design process: are there new ways to inspire creativity? What impact does the structure of the design process have on the final product? We started off the day talking about what works and what doesn’t in our current processes. Starting with big ideas and narrowing down to fit the constraints was the known process in the room. Yet we wondered, has anyone ever tried to start small and grow to fit the available resources? Everyone agreed that the way we have to design our production schedules leave little to no room for the realities of life or even the possibility of making a mistake. Couple that with a lack of time for research and development of techniques and materials and we begin to get an idea why we often stick with what we know. (Photo 1, above) Childsplay production manager Anthony Runfola shares his team’s design of A Midsummer Night’s Dream. It was also noted that it is unfortunate that the people who collaborate the most on the show – the actors – are the last group brought into the process. 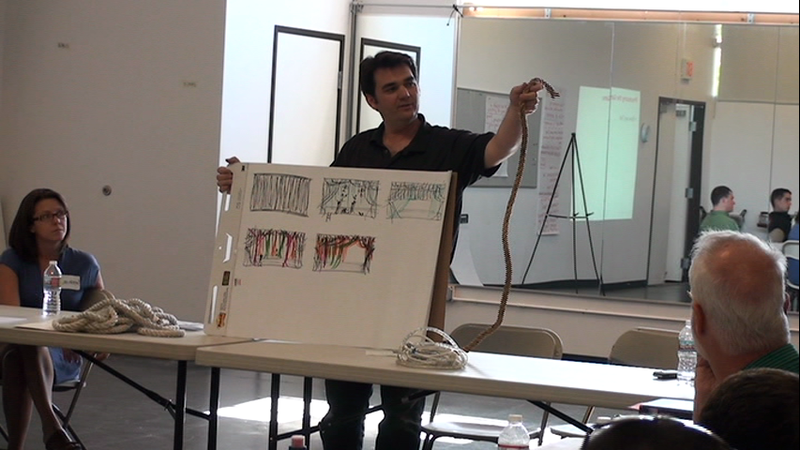 Continuing to work with students from Arizona State University’s Global Institute of Sustainability, an activity was created that would simulate the design and production of scenery for A Midsummer Night’s Dream from the first design meeting through to strike – all in about an hour and a half. The attendees were split into two groups: Team Puck and Team Theseus. While each group included artistic directors, directors, scenic designers, technical directors and production managers, everyone switched roles throughout the process in order to get a feel for each other’s positions. From the outset, design parameters were set – the teams were given a budget and a theatre in which to perform. Sustainability was given to one group specifically as a criterion, while the other group had to deal with a surprise budget-slashing in the midst of their process. (Photo 2, above) Arizona State University professor Rachel Bowditch and Actors Theatre production manager Erica Black take us through their team’s production of A Midsummer Night’s Dream. As could be imagined, there was resistance at first. But, once the groups dove into the play and the ideas started to flow, everyone engaged. The exercise gave everyone a chance to take the time to think objectively about their design processes and think about where possible changes could be made. Most significantly, when looking through the lens of sustainability, everyone found that they made difference choices about the design even before the pencil touched the paper. Making choices earlier clearly emerged as a key to sustainability, yet we also concluded that it would be difficult to change the design process without changing processes throughout an organization. Many factors affect the production calendar (marketing, audience willingness, money, performance space, etc.) that are beyond the control of the designers and production team. Nonetheless, we did identify several opportunities to effect change. It was suggested that our decision trees should include the impact of our artistic choices on the sustainability of our staff. Since both teams had a technical director on them, it was also recognized that having that person engaged more throughout the process made it much smoother. Confidence in feasibility of achieving the design was much higher, and it gave the TD insight into the “whys” of the design. While our second summit did not end with transformative actions that the participants could take, we do hope that we took the first step in adding adding “sustainability” into the good, cheap and fast paradigm. Childsplay - Sustainable Stagecraft Summit #2 from Anthony Runfola on Vimeo. How Do You Go from Learning to Read to Reading to Learn? While discussing the upcoming focus groups with Co-Artistic Director, Jane Jones, a discovery was made. Book-It staff is doing an exercise where we’re finishing our mission statement “...and to inspire our audiences to read...” examples might be “a book by the same author,” “for pleasure,” or “to see things from a different perspective.” The exercise is designed to help us develop hypotheses that we can explore in the focus groups. As I took notes on how Jane would finish our mission statement, she was making reading comprehension connections. THIS IS THE WORK! Here's the deal, we can say the Book-It Style can change/help/be a catalyst for literacy, but that means very little to learners, funders, audience members, until we are able to explicitly state how. As we talked, I probed about her thinking & reading process that's developed because of working in the BIS - I was able to make concrete connections to reading comprehension - the process of making meaning out of words, phrases, sentences. This is the same research they did when trying to figure out how to teach people how to read. They watched, questioned, studied good readers to codify their process. These are people who naturally read well. They took these processes and they became "reading strategies" - these are what we now teach children and struggling readers of all ages when they move from learning how to read (grades K-2) to reading to learn (grades 3 and up). This is awesome and the meat of our work if we are to develop a literacy center. More will be explored with both Artistic Directors Jane and Myra Platt and perhaps other artists in the company. And...check out the article our high school students wrote about the Book-It Page-to-Stage project. This is the project where we’ve been piloting assessment tools. It’s titled, “Think it, write it, Book-It!” – sounds a lot like a TCG grant. There are some facts in the article that are a little off - for example, it’s our 9th year not the 20th at the school – but whatever, between the pictures and article you’ll get a sense for the student work around analyzing, adapting, and performing their own poetry – all stuff we’ve been digging into because of TCG. Think it, write it, Book-It! When we started the first round of the A-ha! program, all anyone could see was a bright horizon of innovation and creation. And of course, innovation never ends, it just keeps right on moving – Seema Sueko of Mo'olelo Performing Arts Center has become a fixture on the “green theatre” circuit, the Playwrights Center is taking time to evaluate their trailers project, Theater Grottesco soldiers on in pursuit of an alternative capital campaign model, and Woolly Mammoth is reporting on their final sabbaticals. Thank you for taking this first leg of the A-ha! journey with us. We look forward to sharing more stories with you! Last month we moved a lot of heavy stuff. This month we crunched numbers. I’m better at moving heavy stuff. Nonetheless, Brad Carlin and I worked out an approximation of monthly/annual operating costs and identified the Coop’s (the Austin Scenic Coop, collaboration by Salvage Vanguard and Rude Mechs) means of generating sufficient revenue to meet those costs. A structure for membership, fees, expenses, etc. was laid out according to a roughly 50/50 split between earned and unearned revenue, and levels of membership were established. The groups who have already declared their interest in Coop membership were sorted into categories as partners, members, and users, and we set goals for the number of each in the next year. Lastly we finalized the plan for the pilot program which constitutes the second phase of the proposal and set a short term to-do list geared toward launching the pilot program in the late summer. On a personal note, it has been very interesting and gratifying to ”take apart” and analyze a project that originated very organically, as a labor of love and also as a common sense measure to make theater less wasteful, cheaper, and more convenient all at once. Looking at the component parts of the operation, and identifying exactly what goes into making it work, has given me a chance to appreciate how much it is possible to do almost without noticing, when you are working at something you believe in. The Coop has already served several groups as a valuable resource, and as we work out the details of its enlargement, it is exciting to think how many more it will be able to serve.